Matt Eagles’ profile page on the Foxtel AFL reality show The Recruit in 2016 told how he was angry at himself for choosing partying with his mates over footy in his younger days, especially after seeing boyhood mates Jared Polec and Jared Petrenko succeed at the highest level. Living in Morningside at the time and listing himself as a scaffolder/massage therapist as he enrolled for series two of the show in which a bunch of non-mainstream footballers were coached by the legendary Mick Malthouse for a guaranteed AFL rookie contract, he vowed to have one last crack at his football dream. It was a long shot at best. A very long shot. Even when Eagles won the show and received a 2017 rookie spot with the Lions he was a long way off the level of AFL football. Teammates questioned what he was doing there, and cynics suggested he only got a chance because there was a contractual obligation between Foxtel and the AFL. Fast forward two years and Eagles is set for one of the most remarkable AFL debuts in history. Having won the total respect and admiration of teammates and coaches alike with his dedication, application, hard work and performance, the 199cm forward/ruckman turned key defender will play for the Lions against Collingwood at the Gabba on Sunday. So popular is Eagles within the playing group there was positive elation when they were told of his selection. Eagles, born 9 February 1990, he will be 28 years 86 days old, becoming the oldest ever Brisbane Bears/Lions debutant. Easily. He will surpass fellow Queenslander Tony Beckett, who in 1987 was the first player to step out of the then QAFL competition into the Bears' ranks. He was 26 years 304 days old and went on to play six games. The oldest first-gamer in the post-merger Lions era has been Stephen Wrigley, who was 25 years 102 days old when he played the first of three games in 2012. Eagles will also be the oldest debutant among the current AFL playing fraternity, going past Hawthorn’s David Mirra who was 27 years 27 days on debut in Round 4 this year. Five other players debuted for the Bears beyond 25: inaugural captain Mark Mickan (26 years 52 days), Adam Garton (25/133), Stephen Williams (25/310), Queenslander Danny Dickfos (25/182) and former No.1 draft pick John Hutton (25/300). The oldest after Wrigley in the Lions era have been Broc McCauley (24/104), Round 6 debutant Oscar McInerney (23/292), Zac O’Brien (23/216), current vice-captain Dayne Zorko (23/93), Irishman Niall McKeever (22/129), Jason Roe (22/55) and 94-gamer turned North Melbourne assistant-coach Josh Drummond (22/25). Born in South Australia but a junior product of Yeronga and South Brisbane, Eagles will wear jumper number 41 on debut against the Pies. Ironically, so did Beckett, the former Mayne Tigers and Queensland wingman. 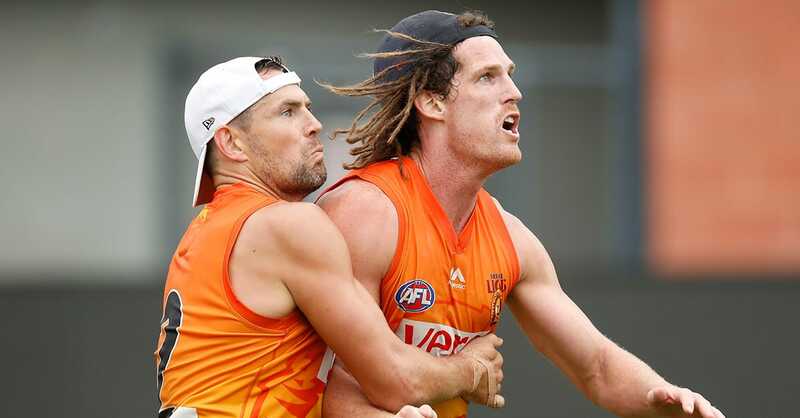 Eagles will be the 314th Brisbane player and the sixth to wear #41, for which ex-Bears and Lions defender Matt Kennedy holds the all-time AFL record for most games at 188. Others to wear #41 have been Marty Pask (8 games), Scott Clouston (2 games) and Mitch Golby (56 games). Thirteen players in the Fitzroy era are listed as having worn #41, headed by Lee Murnane, who played 51 games from 1981-84, and Peter Bird, who was the last Fitzroy player to wear #41 when he played 15 games in 1995-96. Others were Tony Spassopoulos (1 game in 1985), Paul McLean (1 game in 1987), Vern Drake (2 games in 1966), Bob Hayton (2 games in 1965), Phillip Early (3 games in 1980), Kevin Ellis (4 games in 1963), John Christou (7 games in 1975-77), Dennis Aspinall (9 games in 1966-67), Ray Brain (13 games in 1972-74), Graeme Shearer (19 games – 1968-70) and Peter Bourke (22 games in 1989-91). When Eagles joined the Lions he was long odds to survive his first year. Like series one winner of The Recruit Johann Wagner, who joined Port Adelaide, struggled even to play at SANFL level, and soon found himself in the SANFL Reserves and out the door. Eagles admitted that he was slow to start with the Lions. A key member of the Lions side that won the NEAFL premiership last year, starring with his intercept work at fullback, Eagles had offered to play for nothing just to keep his spot on the list this year, but the Club, having seen such massive progress, committed to giving him a chance and listed him as a Category B rookie. Eagles said he tried not to think too much about things as he waited to learn whether he would get a second year at the Gabba. “Thinking about that takes you off footy, and you can get caught up in it. I tried not to think about contracts and just tried to play my best footy,” he said. Few players in the current system of elite junior development pathways have walked a path like Eagles. As he told lions.com.au when he was listed for 2018, Eagles has been no stranger to hard yakka over his young life. He’s worked as an excavator/operator at Olympic Dam mine in South Australia, did dredging work in Gladstone, regional Queensland and at one time owned a landscaping business. He grew up in Port Lincoln, South Australia, and did not start playing footy until he was a teenager. A friend asked him to come down to his club one afternoon. He’d hardly played footy before – he enjoyed playing mixed netball and cricket. His father, a Collingwood fan, had dabbled in footy but was better known for his surfing prowess. He had to make a choice: stay playing local footy or go to the mines and earn a decent wage. He took the money.